The headquarters hotel for this year's championships was the Comfort Inn in Asheboro, where many of the competitors stayed. 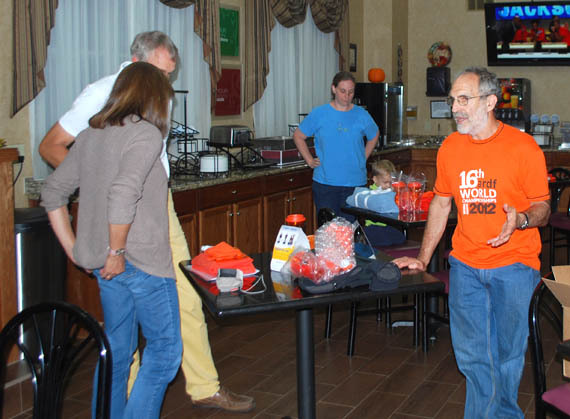 Early arrivers came in Tuesday, October 8 and met near the lobby at suppertime. Meet Director Joseph Huberman K5JGH and his helpers took menu orders and passed out tickets for the Saturday banquet. 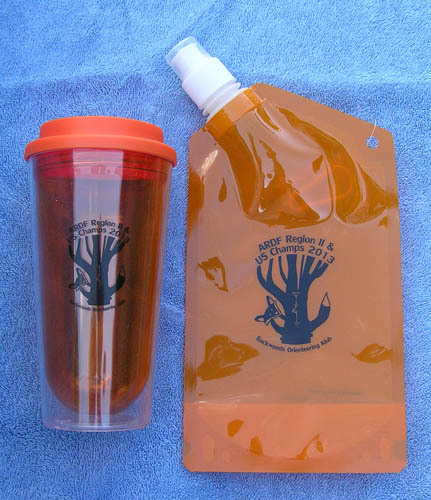 Each registered attendee received these commemorative souvenirs. Ruth Bromer WB4QZG was Registrar. She did the computer work, which included registrations, starting orders, electronic scoring and results tabulations. 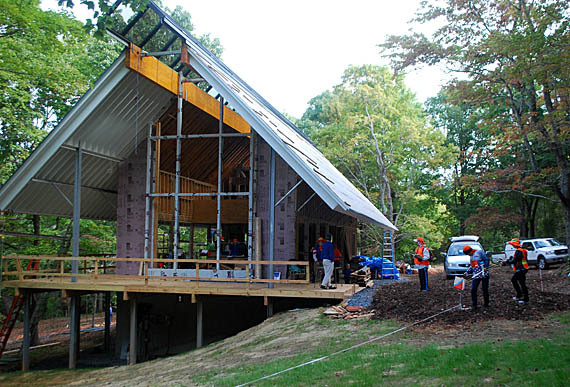 For Wednesday's practice sessions, everyone drove to Gray Owl Road in the southern tip of Asheboro, where Joseph and Ruth's new home is under construction. 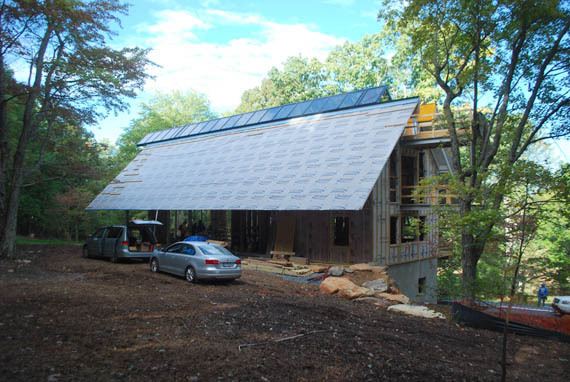 It's right on the edge of the Uwharrie National Forest with a canopy view. Mike Schuh KF7QDZ (in blue shirt) and others got tours of the house before the practice sessions began. 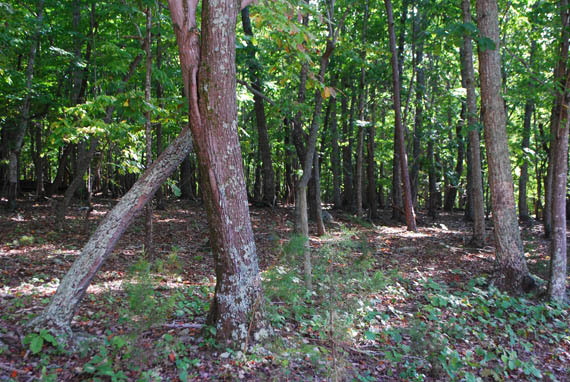 A view of the forest from the Huberman home. 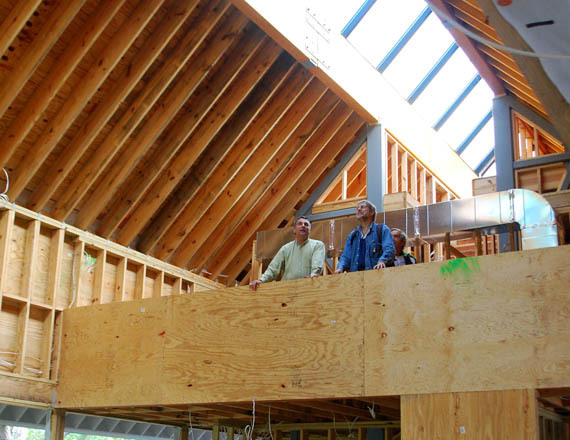 Workers were installing metal roof panels as the practice sessions started and ended in the back yard. The remnants of Tropical Storm Karen had passed through two days earlier, but there was only occasional very light rain and mostly cloudy skies on this day. 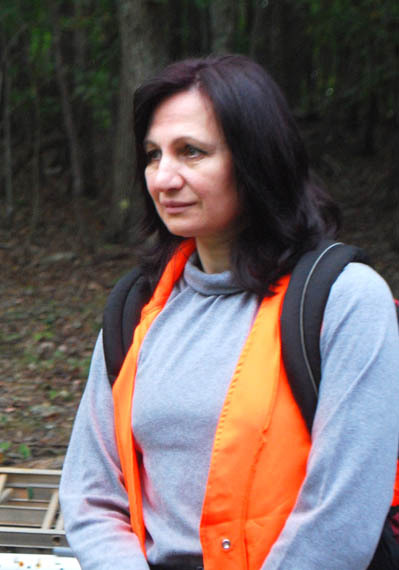 All of the courses were designed by Nadia Scharlau, who learned ARDF as a youth in her native Russia. 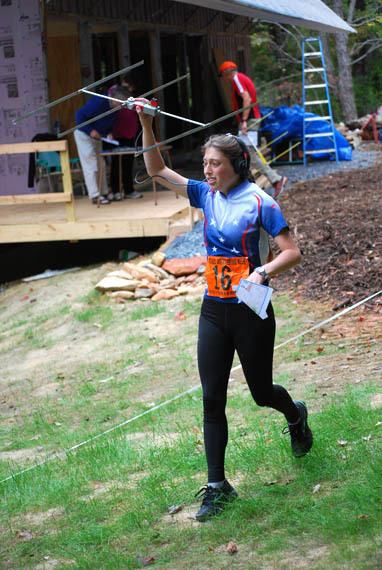 Now a resident of Cary, NC, she has competed four times on ARDF Team USA and in 2006 was the first USA team member to win a medal at the World Championships. Charles Scharlau NZØI has also been on Team USA. He was in charge of setting out all of the course transmitters (a total of 42 during the five sessions). 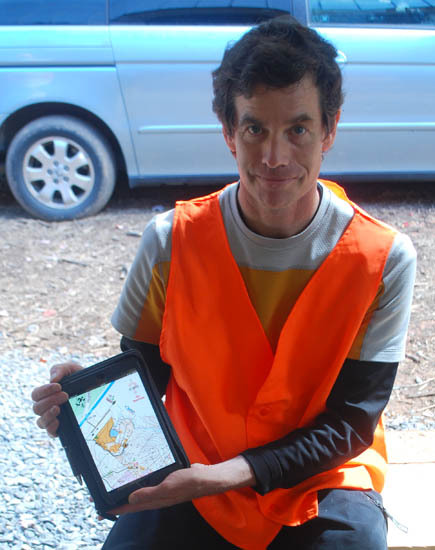 Charles is a software engineer who has created the Map-n-Compass app for iPhone and iPad. 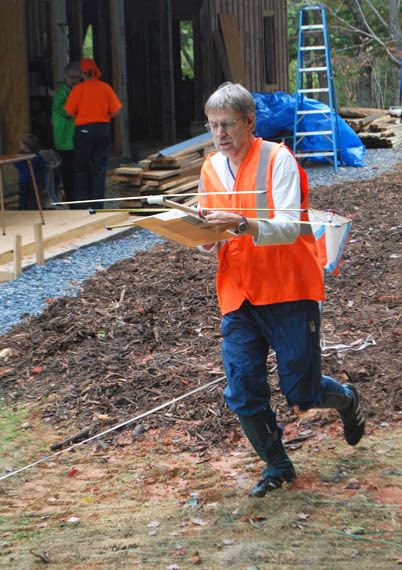 He says it was of immense help in the course design and setting. 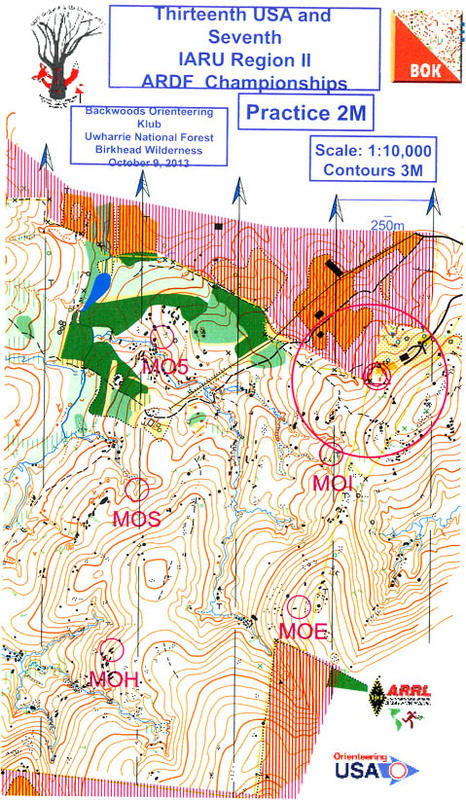 This is the orienteering map for the practice sessions on Wednesday, showing the two-meter transmitter locations for the morning session. Of course the competitors' maps didn't have the transmitter locations on them. Maps for all of the competitions were 1:10,000 except the sprint, which was 1:5,000. This practice map was 4.5 x 8 inches. The largest map was almost 11 x 11 inches for the two-meter competition. 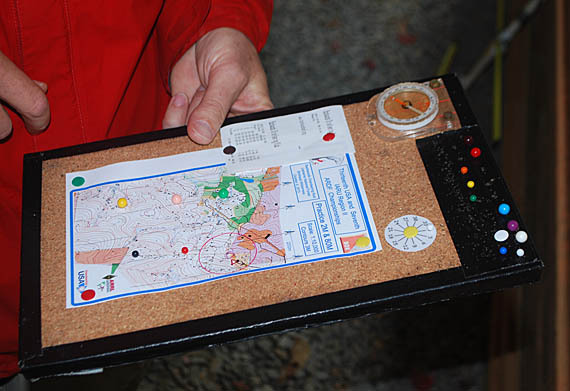 Most competitors tape their maps to a lightweight and rigid flat surface. (Old political campaign signs are ideal.) The Germans prefer corkboards like this. Colored pushpins mark the transmitter locations. The morning course was on the two-meter band. Since Ruth and Joseph were not the course designers and had no advance knowledge of transmitter placement, they could compete along with everyone else. 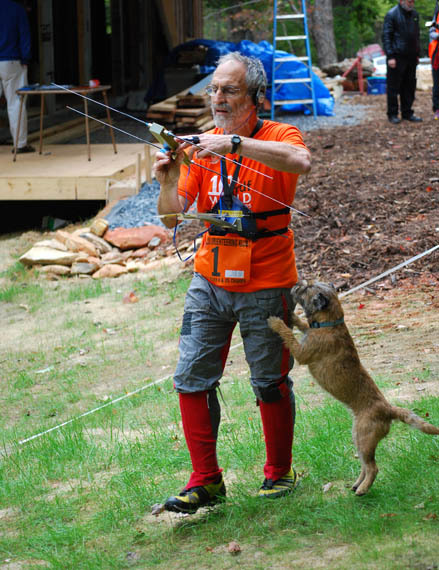 Their dog Kiwi loves to run along with Joseph when he goes out on orienteering and ARDF courses. 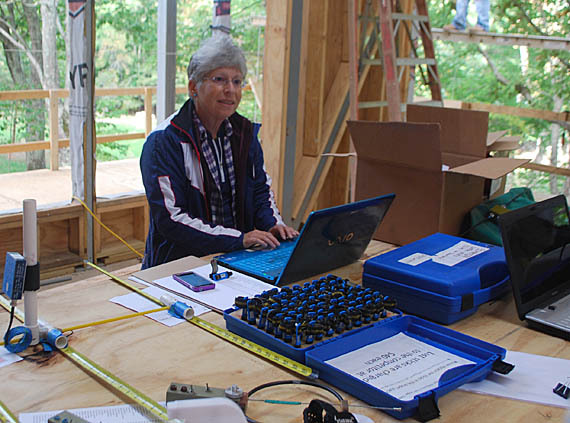 Like most USA radio-orienteers, Ruth uses a measuring-tape yagi on two meters. The handle lets her hold the antenna over her head for better signal and it puts the receiver at eye level. 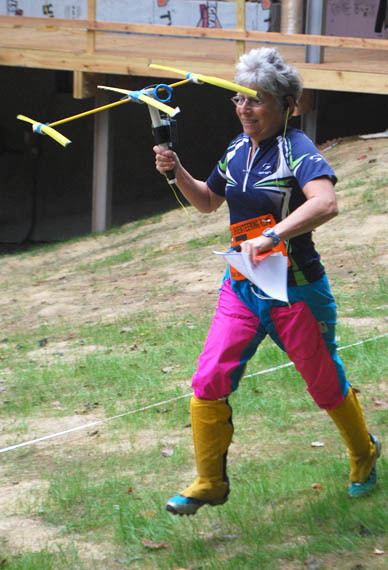 She captured two bronze medals at the 2012 ARDF World Championships and World Cup competitions in Serbia. Joseph and Ruth's daughter Lori has been enjoying ARDF since 2009. This is the second USA ARDF Championships for Mike Schuh KF7QDZ. Photos and captions Copyright © 2013 Joseph D. Moell. All rights reserved.